Nevis’ Premier the Honourable Joseph Parry and St. Kitts-Nevis’ Prime Minister Dr. the Honourable Denzil Douglas demonstrates partnership at the swearing-in ceremony of NIA’s ministers. NIA-CHARLESTOWN, NEVIS (July 13TH, 2011) — Men smartly dressed in well-tailored suits, women neatly attired in business casual dresses, children draped in paraphernalia of the Nevis Reformation Party [NRP] and an abundance of green flags swaying from left to right was the scene at yesterday’s [July 12] official swearing-in ceremony for the ministers of the Nevis Island Administration [NIA]. 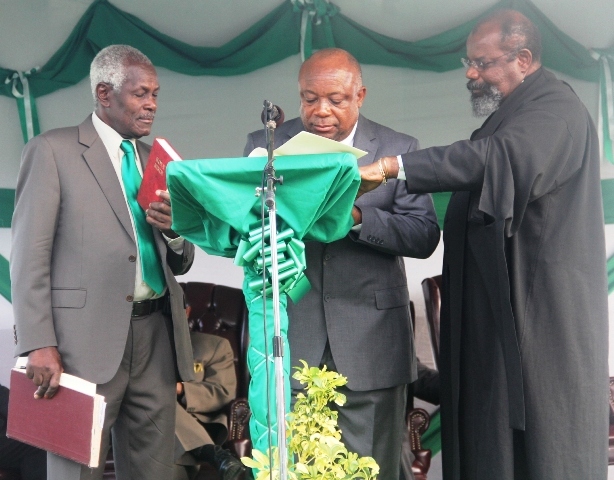 The ceremony, which was held at the Elquemedo T. Willett Park, attracted the participation of the Prime Minister of St. Kitts-Nevis Dr. the Honourable Denzil Douglas; Minister of Religion Canon Alson Percival; Chairman of the Nevis Reformation Party Mr. Herman Liburd, His Lordship Justice Errol Thomas and Secondary School Student Jazee Connor. 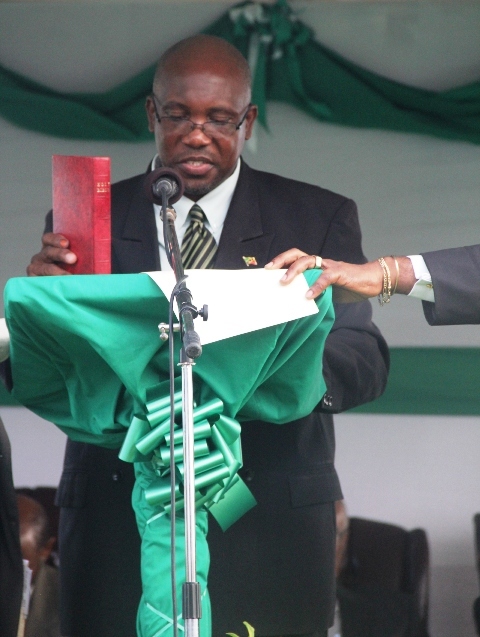 Following the oath of allegiance, oath of office and oath of secrecy by the Honourable Joseph Parry; the Honourable Hensley Daniel; the Honourable E. Robelto Hector; the Honourable Carlisle Powell and the Honourable Dwight Cozier, Premier Parry delivered an address which was described as “well put together” by a large number of the event’s attendants. In addition to outlining some of his administration’s plans for the next five years, the re-elected leader spoke with gusto of the anti-crime initiatives and policies that will take effect. “My party fully understands that our first duty is to keep our citizens safe. 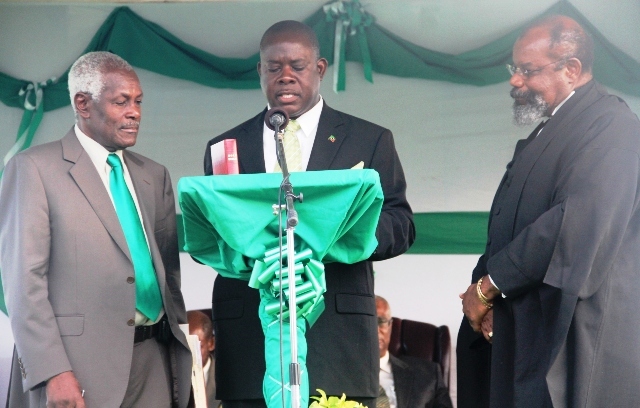 This is a sacred duty: a duty that stands at the apex of our national responsibilities and endeavours,” Premier Parry said, as he issued a unity challenge to the people of Nevis. 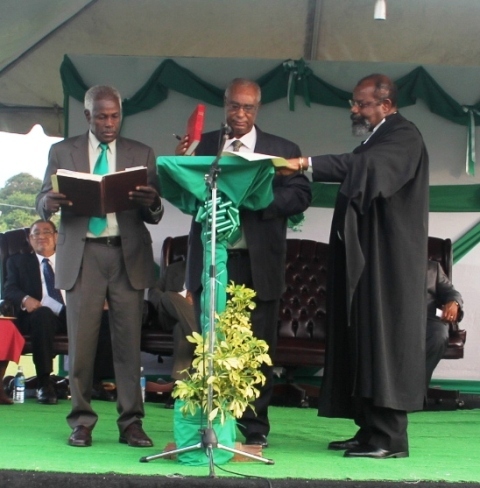 The Honourable Joseph Parry sworn in as Premier of Nevis and Minister of Finance, Statistics and Economic Planning, Education and Library Services, Human Resources, Tourism and Labour by Justice Errol Thomas and in the presence of Mr. Herman Liburd (first from left). “I implore all citizens of goodwill to ban themselves together, to put your shoulders to the wheel in order for us to accomplish this great endeavour of stamping out crime. United in this great cause, we shall prevail,” he said. The thunderous applause at the end of Premier Parry’s address was juxtaposed with even louder cheers as Nevisians welcomed Prime Minister [PM] Douglas to the podium. PM Douglas, who is also the leader of the St. Kitts-Nevis Labour Party and serves as Chairman of the Caribbean Community [CARICOM], used the opportunity to congratulate the NRP team for being elected to a second term in office. 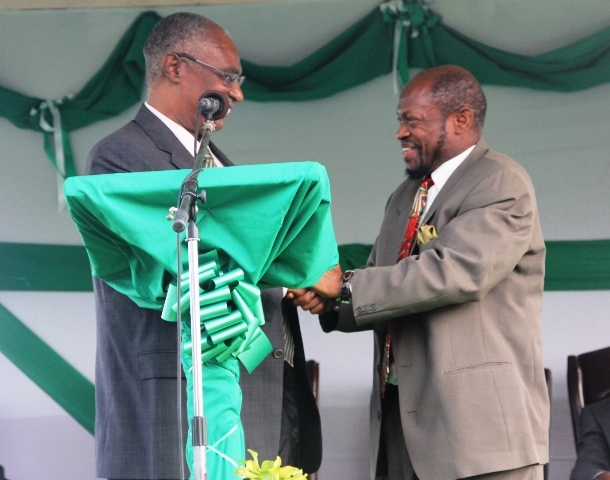 He said that although his administration had worked, for many years, with the former Concerned Citizens Movement [CCM] Administration, he was particularly pleased with the bond established between his St. Kitts-Nevis Labour Party-led Administration and that of the NRP. “I’ve had the support of the people and the blessings of God to work not only with the NRP government for [the] people of Nevis but also with the CCM government on behalf of the people of Nevis. They have been 16 beautiful years but I say to you this evening, that the last five years in particular have been positive and progressive five years with the NRP, PM Douglas exclaimed. 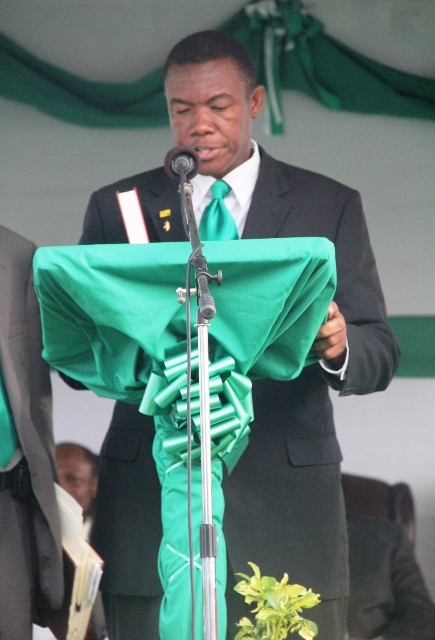 The Prime Minister’s address, like Premier Parry’s was well received by the audience as his use of the popular phrase “it’s working” left Nevisians cheering. The Honourable Hensley Daniel sworn in as Deputy Premier and Minister of Health, Gender, Social Affairs, Youth and Sports, Community Affairs, Trade, Industry, Culture and Telecommunications. Premier Parry remains Minister of Finance, Statistics and Economic Planning, Education and Library Services, Human Resources, Tourism and Labour. The Honourable Hensley Daniel will serve as the island’s Deputy Premier and Minister of Health, Gender, Social Affairs, Youth and Sports, Community Affairs, Trade, Industry, Culture and Telecommunications. The Honourable E. Robelto Hector will serve as Minister of Communications, Works and Public Utilities, Posts, Physical Planning, Natural Resources, Environment, Agriculture, Lands, Housing, Cooperatives and Fisheries. Junior Minister, the Honourable Carlisle Powell, will maintain his responsibilities for Communications, Works and Public Utilities, Posts, Physical Planning, Natural Resources and Environment while fellow Junior Minister, the Honourable Dwight Cozier, was sworn in to retain responsibility for the Ministry of Trade and Industry with special focus on Trade, Consumer Affairs, Industry, Import and Export Control. The event which was scheduled to commence at 5pm went into the evening and ended with the newly sworn in ministers and PM Douglas greeting members of the audience. Also present at the swearing-in ceremony were Deputy Governor General His Honour Eustace John, Minister of Culture in the federal parliament the Honourable Marcella Liburd, Attorney General and NRP candidate for the St. James Parish the Honourable Patrice Nisbett and NRP candidate for the St. George Parish Mrs. Patricia Hanley. The Honourable E. Robelto Hector sworn in as Minister of Communications, Works and Public Utilities, Posts, Physical Planning, Natural Resources, Environment, Agriculture, Lands, Housing, Cooperatives and Fisheries. The Honourable Carlisle Powell sworn in as Junior Minister of Communications, Works and Public Utilities, Posts, Physical Planning, Natural Resources and Environment. The Honourable Dwight Cozier sworn in as Junior Minister of Trade and Industry with special responsibility for Trade, Consumer Affairs, Industry, Import and Export Control.